Politico has offered ten possible questions for the media to ask of President Obama tonight. Why should we enact card check? China says their factories make goods for the U.S., thus the pollution in China is U.S. pollution and Americans should pay to clean it up. What say you President Obama? What in the consitution gives the U.S. the right to tax anyone like AIG executives at 90% and what gives the U.S., in the constitution, the authority to take over businesses? Your kids go to private schools in Washington DC. But poor parents will lose their vouchers if the government of the District has their way. If this a good thing? 1) You’ve dismissed the stock market’s frequent zig-zags, but do you think Monday’s rally in the Dow amounted to a Wall Street stamp of approval for your bank bailout plan? 2) Given that 15 of the top 20 AIG bonus recipients are now returning their bonuses, do you think the House acted too hastily to pass a bill levying a punitive tax on those individuals? 3) You talked on “60 Minutes” about missing the ability to talk to everyday Americans, but can you tell them for a moment how this economic downturn is impacting you and your family? 4) Wall Street is, understandably, coming in for significant blame over the current financial crisis. But what responsibility, if any, do average Americans bear for the problem? 5) On health care, you included a government-run insurance option in your campaign platform. Is that a must for comprehensive legislation? Also, some in your own party have expressed concern about paying for healthcare by, in effect, raising taxes on upper-income taxpayers, as you have proposed. Are you willing to pay for it through other means? 6) How many appointees have received waivers from your new ethics rules barring lobbyists from working in government? 7) Larry Summers told New York Magazine last summer that he hoped you didn’t believe what you said about renegotiating the North American Free Trade Agreement with Canada and Mexico, while you were touting your opposition to the treaty on the campaign trail. So where do you stand now — will changing NAFTA become a priority for you, or not? 8) Throughout the campaign, you said Afghanistan represented the central front in the battle against Islamic terrorism but on “60 Minutes,” you said there must an “exit strategy.” How long do you expect to keep American troops on the ground there? 9) Appearing before a crowd chanting “Death to America” and “Death to Israel,” Iran’s Ayatollah Khamenei rebuffed your video outreach to this country last week. Is there any hope of reaching a new, less contentious relationship with Iran? 10) Most modern presidents have found it useful to confer with the other living presidents because of their unique insights and perspective. Can you tell us which presidents you have consulted since entering the White House and generally what you discussed? Obama Picking Media Haves, Have Nots More than Predecessors? The problem wasn’t the lighting in the East Room. The President was running down a list of reporters preselected to ask questions. The White House had decided in advance who would be allowed to question the President and who was left out. Presidents are free to conduct press conferences however they like, but the decision to preselect questioners is an odd one, especially for a White House famously pledged to openness. We doubt that President Bush, who was notorious for being parsimonious with follow-ups, would have gotten away with prescreening his interlocutors. Mr. Obama can more than handle his own, so our guess is that this is an attempt to discipline reporters who aren’t White House favorites. Few accounts of Monday night’s event even mentioned the curious fact that the White House had picked its speakers in advance. We hope that omission wasn’t out of fear of being left off the list the next time. Bling Fling Stimulus and Obama Faces Questions With: Answers? The stimulus is a “bling fling” of tossing around the goodies for the sake of pleasure. But what do we get for sure? Debt and spending. The experts can’t agree on the rest. Some say it will create a million jobs. Some say 4 million. Some say in two years. Some say four. Some say its temporary. Some say it is purely an effort to make communities and people dependent upon the public trough. And the media has been fawning over Barack Obama for many months. Obama’s “positive” rating is now some 67%. The stimulus? Only half the voters like it. Given all of this, will the right questions be asked by the media tonight? Probably not. But Politico’s Jon Martin did a great job explaining what the questions should be. If I was a Republican lawmaker I’d vote against the stimulus. If I was a Democrat I’d go with the president. And hope. But as a Democrat in the Senate I’d know this stimulus package is a terrible piece of pork foisted upon the Senate by Nancy Pelosi and her Democrats in the House. The risks for Obama are considerable. He and the Democrats will have no one else to blame if the package fails to boost the economy. Obama himself has said his first term can be judged on whether it succeeds, whether it creates or saves the 3 million to 4 million jobs he promises. And if the economy fails to show marked signs of improvement — a possibility indeed — Republicans will have a megabillion-dollar “I told you so” in their pockets, just in time for the 2010 midterm elections and Obama’s own reelection bid in 2012. My number one question for all voters who watch the president tonight: does this look like a campaign or a man honestly defending the best possible economic jump start? Number two question: Is the media digging for the truth? President Barack Obama faces a barrage of questions on his plans to reinvigorate the economy with a massive stimulus bill and additional billions in bailout money for the financial markets. The president traveled here on Monday and is going to Florida on Tuesday, to cities hurting badly from the economic meltdown, and is holding a prime-time news conference at the White House on Monday night. The blitz shows that Obama and his advisers are worried about a looming Senate vote on the stimulus bill, which failed to gather meaningful Republican support during rare weekend debate. A key vote on the legislation was set in the Senate for Monday afternoon. The sessions allow Obama to appeal directly to Americans for grass-roots backing of his plans. He planned about an eight-minute opening to his news conference aimed at arguing on behalf of quick passage of the stimulus, White House press secretary Robert Gibbs said. For his first direct pitch to citizens, Obama scheduled a town hall meeting here in northern Indiana, where the unemployment rate soared to 15.3 percent in December, up a whopping 10.6 percentage points from December 2007. The region has been hammered by layoffs in the recreational vehicle industry. On Tuesday, he plans to visit Fort Myers, Fla., an area hit hard by home foreclosures. Governor Rod Blagojevich called a news conference in Illinois today after he was impeached by the State House of Representatives. He gave an off the cuff monologue that seemed detached from the reality and the facts of his impeachment and federal corruption charges. “I am not guilty of any criminal wrongdoing,” he said. But it took him four or five pages full of words and five full minutes to say this…..
“The House action today was not a surprise. It was a foregone conclusion,” Blagojevich said at a news conference in Chicago. “From the very moment of my re-election, I’ve been engaged in a struggle with the House to try to get things done for people. “The House’s action today, and the causes of the impeachment, are because I’ve done things to fight for families who are with me here today,” he added. The Illinois House voted 114-1 to impeach Mr Blagojevich, although only 60 votes were needed for the motion to pass. “It’s our duty to clean up the mess and stop the freak show that’s become Illinois government,” said Jack D Franks, a Democratic representative. 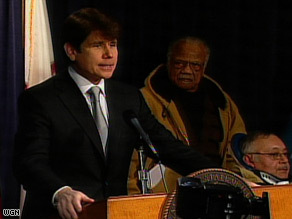 Illinois’s State Senate will now try Mr Blagojevich. If found guilty, the governor will be forced out of office. I’m no psychiatrist but Blagojevich looked and acted like a crazy man today — which shouldn’t help his friend Roland Burris who he appointed to the U.S. Senate…. Ilinois Gov. Rod Blagojevich says his impeachment was politically driven. Illinois’ highest court on Friday validated the appointment of Roland Burris to fill Barack Obama’s vacant U.S. Senate seat, ruling that the Illinois secretary of state does not have to sign off on it. 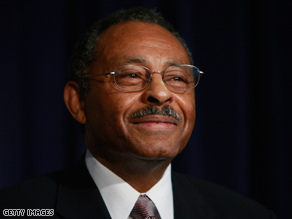 Roland Burris’s appointment to the U.S. Senate is valid, the Illinois Supreme Court says. You are currently browsing the archives for the press conference category.